Reg has long been established in the yacht sales business, successfully representing manufacturers, buyers and sellers, as an independent yacht broker for over three decades. For the last 17 years, Reg has been based in St. Maarten and has offered effective client representation through his broad reach throughout the Caribbean. 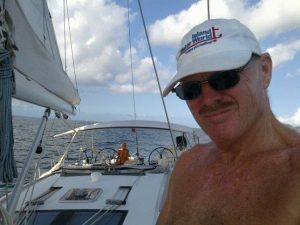 His long-time presence in the islands has given Reg extensive knowledge of the unique Caribbean market, where for years he has served customers looking to expand their sailing experience by graduating to a ‘Bluewater’ cruising boat experience. Reg is very familiar with the logistics of registering, mooring, storing and maintaining vessels in the Caribbean. In addition, he can even offer his customers custodial care services for their vessel. Reg, born and raised in Toronto’s Beaches neighbourhood, operated out of the Outer Harbour Marina for many years and brings to this affiliation many years of experience in the Canadian Market. As for the St. Maarten location, Reg will be based at Port Cupecoy Marina, on the Dutch side of St. Maarten, widely recognized as one of the finest Marina properties on the Island. Learn more about NSNG Caribbean services including pre and post purchase sales and owner absentee custodial services.